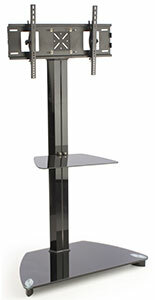 These glass TV stands are beautifully crafted for use in living rooms, dens, or even waiting rooms and lobbies. Some of the many LCD mounts available here have glass or metal accents that blend nicely as an entertainment center with any home or office décor. Each tempered glass TV stand, or residential LCD rack, has its unique features, so look at the wide variety of sizes and styles sure to find the right model. Our website includes pertinent VESA sizing and mounting information to ensure that your unit will fit on the rack chosen. Using the cheap LCD TV stands for plasma televisions is also simple since they have slots in the poles or glass to pass wires through. This feature enables users to maintain a tidy display while keeping unsightly monitor wires out of sight. Why are these tempered glass TV stands, LCD racks, and entertainment centers becoming so prevalent in homes across America? More and more consumers are opting to buy LCD TVs rather than the old bulky CRT models. With the change to the slimmer plasma televisions, there is no longer a need for huge entertainment centers to place a Vizio 40" or other LED TV. Is there a lot of setup required for these plasma screen entertainment centers? All of these glass tv stands & racks ship unassembled in an effort to keep shipping costs down. This plasma television furniture includes a detailed set of instructions and all of the required tools & hardware. 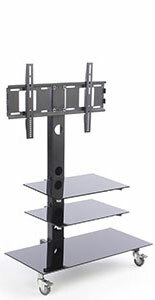 These LCD racks and stands can be assembled by a single person, however two people may be needed to mount the television. One of the best-selling glass entertainment centers in this selection is this clear rack. With the durable tempered glass base, backer and shelf, this plasma monitor rack is exceptionally stable. The shelves on these monitor racks allow for the placement of a DVD player or other electronic equipment. 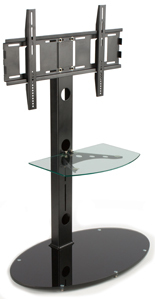 The TV stands fit most makes and models and are able to hold a plasma display that has a 32" to 42" viewing area. In addition to the glass accents on the racks, there is also a silver aluminum support on the base to coordinate with the vertical support columns. 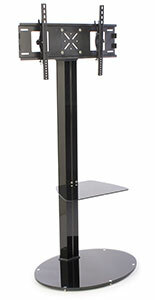 The mount for the 40" wide screen television on these LCD stands was designed to be fixed at the optimal display height for this sized plasma display. Another great preference among these plasma racks is the tall height. The TV brackets have a commanding height of over six feet tall. Like most of the other LCD mounts available here, this unit has a glass base. The base is oval shaped and helps to keep the furniture stable. There are two shelf attachments included with these plasma racks. The shelves are metal and are the perfect size for holding electronic games and video players. 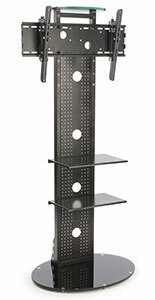 For a business office this shelving can be used to display magazines or other information brochures. One of the unique features of this monitor stand is the tilting LCD mount. 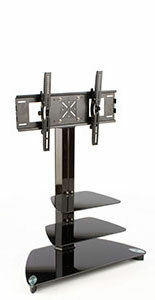 The bracket allows the viewer to position the plasma monitor to the desired viewing angle. The mount can hold a television that weighs less than 110 lbs. 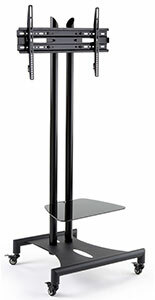 Each stand has a stunning black metal finish that will blend nicely to an existing modern décor. Buy one of these compact racks instead of an old-fashioned wood furniture stand. Almost all of these stands feature an adjustable glass shelf. These shelves are ideal for placing DVD players, game systems, or cable boxes in close proximity to the plasma or LCD television. The 42" TV stands and LCD racks are shipped unassembled to save on shipping costs, but all include instructions to be quickly assembled in minutes. There are a variety of screws, washers, as well as spacers included with the 50" plasma television entertainment centers for attaching an LCD television to the racks; however, some may require specific screws that can be purchased at a local hardware store. Purchase one of these amazing looking stands today to complete a living room with a stunning entertainment center that will have friends astonished! One of the more deluxe plasma displays included in this impressive lineup of stands is this rack with both tilting and panning capabilities. This entertainment center features three alluring black glass oval shelves that can be used to display pictures or to keep electronic accessories up off the floor. 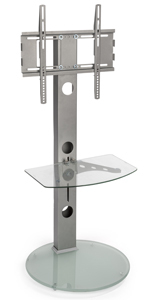 The LCD mount on this TV stand can be repositioned both left & right as well as up & down. This allows the viewer the flexibility of only having to adjust the television rather than the entire entertainment center. 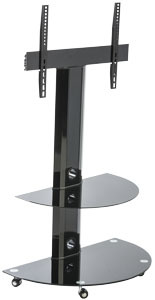 This LCD TV stand is commonly used in homes, but is also suitable for waiting rooms and lounge areas. There are many other advantageous amenities on these entertainment centers such as plastic feet to minimize floor scuffing, and holes throughout the vertical support pole to keep wires out of sight. Do any of these 40" monitor racks have tilting or panning mounts? Some of the stands featured here do have tilting brackets. 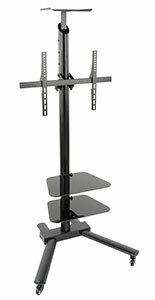 In addition, there are a couple of tv stands that feature panning mounts. For additional information on any of the stands featured here, please contact a member of the customer service team. In addition to the huge array of 40" LCD TV racks shown here, there is an equally impressive selection of wall mount brackets in this online catalog. Pick from articulating, tilt mounts, fixed brackets, even remote controlled displays. Regardless of the need there is sure to be a mount here that meets any need. For more than 39 years, Displays2go has been selling quality POP displays at discount prices. New merchandise such as these LCD mounts are added to this website on a daily basis. This online catalog features thousands of displays, and we are continuing to design and look for more to offer! Be sure to bookmark this site and come back often to see what new and innovative objects that has been currently added! As an added bonus to customers, same day shipping is offered on 90% of the units sold here, including these television racks! Simply order in stock objects before 3PM EST, and it ships the same day!